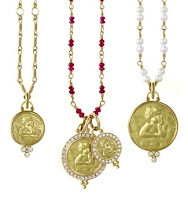 I have several pieces and love them all – from my zodiac pendant, to my drop pearl earrings to my new addition which you display – thet angel pendant that is surround by diamonds. You are so right – everything is classic and timeless! Really very nice post and amazing that all jewelry such a beautiful and strange jewelry, thanks for share with all of us.